Warm weather’s official pattern is stripes, which I think everyone knows. We all love stripes, but this season I feel like more and more people are gravitating towards polka dots instead. I know that I’ve had my eye on a few polka dot pieces lately so I created this guide of polka dot dresses, tops, and swimsuits to fill all of your warm weather pattern needs! If you can’t tell by now, polka dots have become my favorite print this summer! 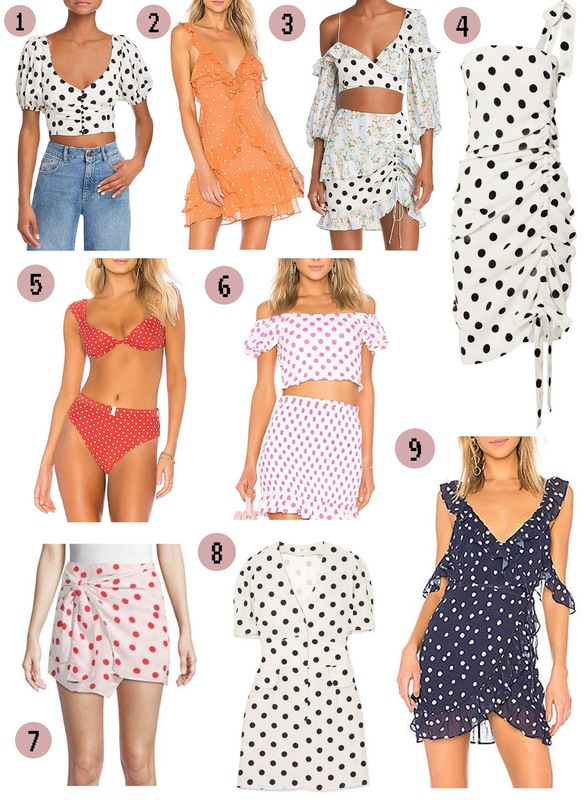 I keep catching myself every time I go to check out on a store online that at least half my cart is polka dots. There are so many different prints and ways to wear it. I think by this point in the summer, about half of my wardrobe is made up of items with polka dots. I love the outfit pieces you chose for your OOTD photos above! That pretty polka dot skirt and ultra-feminine short puffy-sleeved crop top look beautiful together. I also love all of your polka dot outfit piece shopping choices. Every one of them looks pretty.